Below is the cover story of my Magazine Project. “Tam-Tam,” “Tong-Tong,” noises of chau gongs and drums echo for blocks during the finale of the annual sChinese New Year’s parade. Thirteen colorful lions move up and down among the crowds on Mott Street, one of the oldest streets in New York’s Chinatown. A bright red lion dances in the center, shaking its head and flicking its tail with energetic movements, the shinning outfit shimmering in the afternoon sun. A brown pair of women’s UGG boots jumps in and out under the delicate fabric of the lion’s tail. The girl who wears them is 17-year-old Kristin Tom-Lew. Kristin’s grandmother, Valerie Tom is currently the executive director of the Chinatown Community Young Lions, a lion-dancing club for youth ranging in age from six to 17. She founded the club in 1972 because her son, Brian, wanted to learn the dance but had a hard time getting into any of the lion dance clubs in Chinatown. Back then, all the lion dance clubs were made up of Chinese who were born in China. These organizations separated themselves from Chinese Americans who were born in the United States. “Brian was not born on the other side. He’s American and they didn’t recognize him,” says Valerie. As a result, Valerie and her ex-husband bought a lion head and other lion dance equipment for Brian and five of his friends. They created a non-profit organization for any young people who wanted to learn traditional Chinese lion dance. Nine-year-old Brian was the first teacher in the club. He learned the lion dance from watching other lion dancers in Chinatown. When Valerie founded the club, her daughter Kathleen was seven years old, and became interested in lion dance. At that time, no girls in Chinatown performed on any of the teams. Kathleen joined the club and began to learn to drum from her brothers and their friends. She also did the lion head dance when needed. “I don’t know why females were not into the lion dance back then. I’m not sure what people thought. 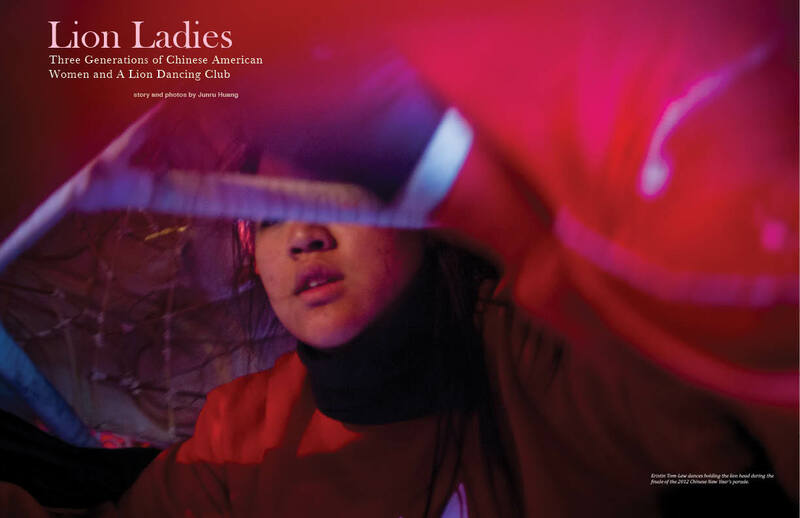 I wasn’t interested in what people thought, we were just doing it for fun,” says Kathleen, who became the first female drummer on a lion dancing team in New York’s Chinatown. The club started out with just six members. There are now approximately 250 to 300 active members, among which there are 25 to 30 girls. In the 40 years since Valerie founded the club, over 3,000 kids have come through the program. Besides the major parades during Halloween and the Chinese New Year, the club is also hired throughout the year for a variety of events including restaurant functions, weddings and birthday parties. The lion dance is more than a tradition— it’s also a religious ceremony in which the dancers act as guardians and harbingers of good luck to come. The team danced in a grand mall in Flushing, Queens when it was opened— lions went around the whole mall, giving blessings to all the stores. All of Valerie’s children and grandchildren are involved in the club. Valerie’s granddaughters, Kristin and Katelyn, both play important roles on the team. Kristin is a great lion head dancer and everybody celebrates Katelyn’s outstanding drumming skills. Kristin’s earliest memory from lion dance was when she was two years old. “I was sitting on the wagon and people pushed us around in Chinatown during the New Year Parade,” says Kristin. She started learning the lion dance at three years old, when her grandmother and her mother bought a little lion head for her to play with. The lion dance helps keep the family close across generations. Kristin is one of the best female lion dancers in the group. She dances just as effortlessly with the heavy lion’s head as any male dancer. Kristin is talented at sports and is the captain of her high school basketball team. She is also a star player on the New York Rokits Girls Basketball Team, a basketball team for girls under 18 in Chinatown. For Kristin, the biggest challenge in lion dance is drumming where “there’s an up beat, a low beat, three balances— and it has to be really smooth.” Her sister Katelyn seems to have an innate sense of rhythm and is a talented drummer. Dancing with the heavy lion’s head is more of a challenge for Katelyn. At the very end of the New Year’s parade finale, Kristin lifted Katelyn up on her shoulders as she held the lion head for a cheering audience. Kristin and Katelyn are fifth generation immigrants. Their great-grandfather came from Toishan, Guangdong, China to New York in the late 1800s. The entire family has resided in New York’s Chinatown for over 100 years. When Valerie was born over sixty years ago, Chinatown in New York was only six to seven blocks. It now spans almost 40 blocks, and the population is 25 times larger. Limited space has caused many of the second and third generations of Chinese to move to other places such as Brooklyn, Queens and New Jersey. But Valerie and her family have no desire to leave. “It’s so convenient to live in Chinatown and we all love Chinatown. It’s home,” says Kathleen. Though Chinatown has expanded since Valerie’s childhood, she feels that her granddaughters’ lives are not as different from her own as one might expect. On weekdays they go to Chinese language school after American school. On Fridays, they go to Girl Scout meetings. They go with their family to church on Sundays. Valerie, Kathleen, Kristin and Katelyn all call themselves “ABCs,” short for “American Born Chinese,” which is a term Chinese Americans use to differentiate themselves from Chinese who are born in China. To them, Chinese Americans are different from either Chinese or Americans since they follow both Chinese traditions and American values. The family still practices many Chinese traditions. Along with the lion dance, they also like eating noodles on birthdays to represent a long life. They still keep the tradition of wearing red for good luck to celebrate the New Year. “On Chinese New Year’s Eve, we worship our ancestors by lighting a candle and incense as well as serving chicken and the suji– all the traditional Chinese dishes for the ancestors. The only difference is, as American born, we don’t usually cook Chinese food. It’s easier for us to buy them cooked,” laughs Valerie. Valerie’s ex-husband was a Scottish man who she met in high school. They had four children together. “I think women can do anything that men can do, and better,” says Valerie, “because we have children and we are forced to multi-task— we have to both work and take care of the family. A man has a tough time doing all of that. He goes to work and comes back and he’s tired. A woman’s job continues.” Though all of her daughters married Chinese Americans, Valerie says she would not mind if her daughters and granddaughters date men from other ethnic groups. Her daughter, Kathleen, still prefers her daughters Kristin and Katelyn to date and marry Asians. “I don’t know why, I just prefer them to stay with Asians,” she says. Kathleen is an elementary school teacher in Queens. She is the strong woman that her mother raised her to be, with both a career and a family. “I want my daughters to be strong, independent women, so that they can stand on their own and don’t have to depend on anybody,” says Kathleen. After the last dance, lions walk on by one into the club at 19 Mott St. to the loud cheering and music, marking the end of the annual show. Dancers take off the costumes and go to a Chinese restaurant, where Valerie orders two big tables of food as celebration. Teenagers laugh and joke around with each other as families and relatives chat about life at this annual reunion. When the night comes, the banquet is over. People say goodbye to each other, pack up the costumes and walk home down the dark streets of Chinatown. i study science and have one of the projects related to this topic. would you allow me to use some of it? Sorry I didn’t see your comments until recently. Sure. Which part would you like to use? Thanks!